Hygiene - What is the facial mask? How is it used? The face mask is a beauty cream your Fashionista can add to her face. You can find it in the Supermarket > Personal Hygiene aisle. It costs 100 FD, and may be used five times. How do I put the mask on? First of all must place the face mask in your bathroom (Home > Bathroom > Accessories). 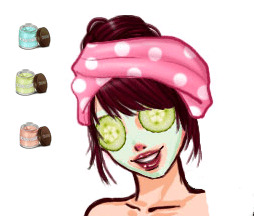 The mask and cucumber slices on the eyes are applied on your face when you click on the pot to use it. If the mask does not go away on its own, just go back to the bathroom to stop the timer and the message that signals the end of the face mask will appear. What does the face mask do? It will increase the Hygiene, Morale and Health of your Fashionista. You will also win 30 FA with each mask.